LaVerne Harding’s alter-ego might just be the girl she drew to life in the early 1930s, the heroine and star of the newspaper comic strip, Cynical Susie. As the strip kept building in momentum—from a single-panel to a daily multi-panel to finally even a color Sunday—its cartoonist nonetheless gave up the trappings of her rising status in the papers to be solely an animator for producer Walter Lantz at Universal Pictures. 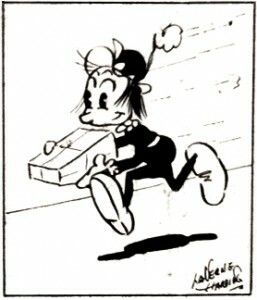 Harding was the first woman to achieve this role in a Hollywood studio, but she took the milestone in stride and diligently kept at her double-life for some time, animating Oswald the Lucky Rabbit and other Universal characters even while she was meeting her growing obligations to the newspaper syndicate. To this end, Harding must have worked nights and weekends, sacrificing any semblance of a social life to keep both careers in play. For a while, she maintained the demands of both, and her male peers must have looked at her with a certain degree of respect, since it was a common aspiration for animators then to want to be cartoonists. She may have worked on a desk at Universal no different than theirs, but when they unfolded the morning paper it was her name they saw in ink. Cynical Susie. By Becky Sharp and LaVerne Harding. 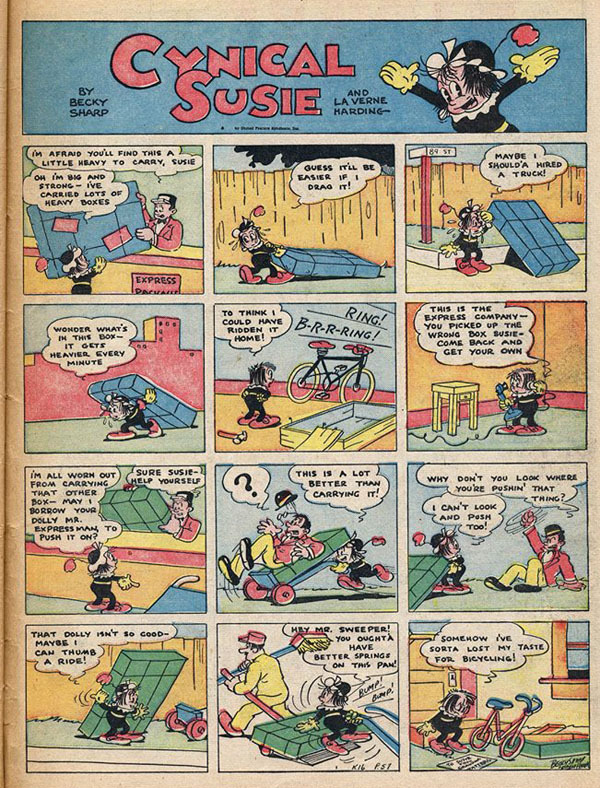 Sharp was the writer and Harding designed and drew the strip, giving Susie a quality that may have resonated with a generation of post-Flapper women who were tilting their lances at the modern world. Even by today’s standards, the character seems appealing and relatable. In her debut four-panel strip (above), we see Susie’s moxie and emotional range: “Peepul everywhere, this is introducing ‘Cynical Susie’. When she is gay, she looks this way. Like people everywhere, she has a tear in her life. Like all of us, hopeful. Sometimes mad like a hornet. Other times lovelorn,” which Harding illustrates with Susie standing in the rain next to a poster of her Silver Screen heartthrob. The big takeaway of reading any sample strips among her comics today is that there is not a single moment in which Susie seems cynical. Instead, she is unflagging, resilient, resourceful, and cheerful to a fault, though sometimes bashful. When life delivers lemons, Susie builds a lemonade stand. She gets things done and she does it in a way that makes perfect sense by her fix-it view of the world. The strip excels in slice-of-life ephemera, showing Susie reacting to unusual things and events with the aplomb of a twentieth century woman. Then, in the last panel, we laugh at her oddball ingenuity. When she hears a football team yelling, “8-13-27-5-Shift!” she runs down on to the field—right into the huddle of players—and she hands them an Adding Machine. That was the theme that any number of newspaper editors were being pitched in this syndicate mailer, but something more may have been bubbling under the surface. For all her foibles and earnestness, when Susie furrows her brow in thought and her flowery hat dips lower on her head, she evokes the impression of a girl with an evolving view of her place in the world. She never ran to get a guy to do something; she did it herself. With all that fixing she could perform, generally unsolicited, she was showing off her budding leadership and resolve. She could be sad, but she was hopeful. Harding was often referred to as quiet, but like Susie there was surely a lot of nuance beneath her persona as a reliable studio facilitator. In 1939, the L.A. Times columnist Read Kendall wrote, “Once Walt Disney said that women did not make good animators for the screen. But one of Walter Lantz’s best animators is La Verne Harding, whom he took out of an art school.” By 1939, she had been an animator for five years, but this opinion of women from Walt, among others, remained unchanged despite her prominent counter-example. Is it any wonder she often used just the masculine short version of her name, Verne. She became an extremely valuable animator to Lantz, continuing to work for him for decades, and she was loyal to him for the fairness he always showed. When World War II changed the landscape of Hollywood animation, Lantz unexpectedly had a key staff person he wouldn’t lose to the draft, though she did also contribute to military films made at the studio like The Enemy Bacteria. 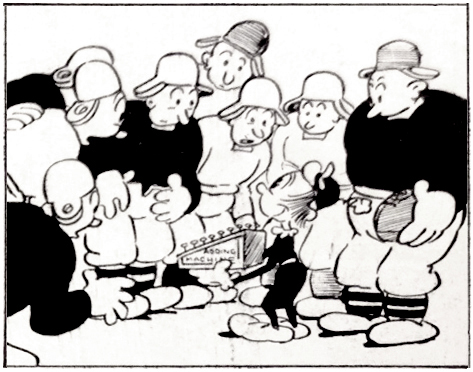 Harding soldiered on as an exception to the rule, an anomaly among the enduring boy’s club of animators, even during the wartime labor shortages that otherwise spurred the ‘Rosie the Riveter’ phenomenon. Wouldn’t that make a girl like Susie even a little bit cynical? In later years, when asked about sexism, Harding would usually redirect the answer to indicate her own positive experiences in the industry, while admitting she was aware there were limited opportunities for women when she started. At Universal, she had gotten a shot at her dream and she stuck with it. For her, it was a wonderful and satisfying career. There is no denying that she was among a vanguard of women who began to challenge the workplace norms of the early twentieth century. Harding made no waves and she defied no one. Yet, by putting pencil to paper every day, garnering respect and admiration, she helped erode a fallacy. It was unlikely that she would have ever labeled herself a feminist—she wouldn’t have wanted the credit or the acclaim for helping to pave the way for other talented women—but just like her own creation, the ever-diligent Susie, she could not help but try to fix a problem in her own way. The comic strip sounds like fun. Too bad she couldn’t have brought her character to the Lantz Studios for at least one cartoon–hey, Paul Terry featured two NANCY cartoons, so comic strips were occasionally used, even if for only two cartoons. She was a wonderful woman. Dallas McKennon (voice of Buzz Buzzard at Lantz) introduced me to her in February of 1971. She tried to get me a job in animation. 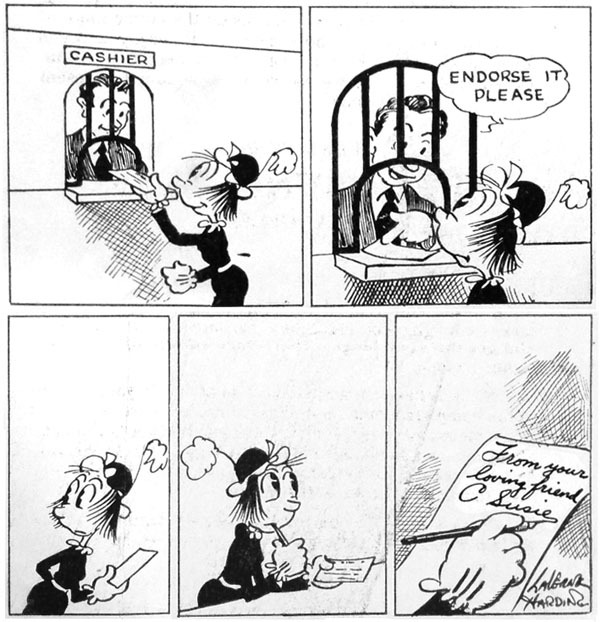 She took me down to the Cartoonist Union and introduced me to Lou Appet. Everyone at at the union office seemed to admire and respect LaVerne. Everyone was glad to see her. He told me to come back in summer when studios were hiring. I was dumb enough, instead of coming back in summer, I went back to Oregon and got married. LaVerne still encouraged me by mail and when my wife divorced me in the summer of 1978, I came back down. I remembered the Cartoonist Union and I called them. They told me Bakshi was hiring and the very next day I was hired on Lord of the Rings. I still owe any luck I had in Hollywood to LaVerne and Dallas McKennon. At the time, being young and ignorant, I didn’t know then what a historically important person she was. I just knew her as a very kind lady. Gene, thanks for sharing that story about LaVerne. And Kevin, I agree; but all we got was cameo briefness, with Susie showing up among the revelry of Oswald/Pooch the Pup, as in the cartoon “Merry Old Soul” (1933). Also, the Read Kendall quote I mention above is from his “Around and About in Hollwood” celebrity gossip column, Jan. 6 1939. And, I want to dedicate today’s piece to one of my heroes, the author, animation historian, and distinguished Cal Arts faculty, Dr. Maureen Furniss. She’s the founder of Animation Journal, which celebrates twenty-five years as an academic publication and in fact is wrapping up its groundbreaking quarter-century run. When I was still a grad student at UCLA, Maureen took a chance on me and published my first peer-reviewed article in her journal in 1994. You guessed it, the topic of the article was La Verne Harding. Maureen has been one of the driving forces in animation studies for the last three decades, and she’s one of those “fix-it” hard-workers, with so much generosity, vision, and energy. She makes everyone around her better while asking for nothing in return. In the early 1990s, I was a budding animator, but she encouraged me to be a researcher/writer too and gave me that first opportunity. Apparently, I caught the bug and never stopped. With endless gratitude, thank you Maureen. Modern feminists would LOVE to read about her secretly brimming with anger the whole time she was working, but it sounds like she kept the times in perspective and maintained a classy attitude about her experiences. On the other hand, post 60’s feminism is about balkanization for the sake of singling out voting blocks based on promises of preferential treatment. It has nothing to do with the bs this lady went through, apparently unscathed. Read the old Sisterhood Is Powerful reader and you’ll see what I mean. I bet Disney’s offhanded comments were less about ability and more about separating the sexes in the workpace so the men in the male “dominated” animation dept wouldn’t be distracted. If he wouldn’t even let them grow a moustache then it wouldn’t surprise me that he’d go to lengths to maintain an air of chastity in the company. Just a note, in spite of the “show about nothing” moniker, Seinfeld always had serialized elements and makes more sense if you watch the episodes in order rather than not. It’s a non issue but it’s worth mentioning. ÖH, there’s so much to admire in LaVerne (we agree on that!) but I don’t begrudge the post-1960s feminists either. And a lot of that has to do with the notion that, from my own reading of history, Walt really was sexist in his Old World calculation of women’s abilities. Yes, he was a perfect gentleman in almost every way, but his assessment of women was informed by a societal notion of where people were traditionally fit in by the norms of the time. What worked for Harding didn’t always work for other women, and it reached a point where I think some voices had to get a little more pronounced (yes, louder) to see more progress. For instance, the personal success of Harding did not lift all boats for other women. As well, for a long time women were summarily dismissed from consideration because they were considered not able to draw as well, without even a formal review. Tom, then my next question will sound cynical, but I’m completely serious. Has the steady decline in quality, the homogenization and creeping blandness which many have noticed in Disney productions since Walt’s death been the result of an intentional rebranding of the Disney image in order to distance the company from its founder’s “old world” standards? Or is it simply the result of an influx of new creators who were informed not by iconoclastic, original art but by copies of copies of copies of iconoclastic original art? It all seems just a little too easy and a little too politically correct to villify an extraordinarily successful and influential creator like Walt Disney these days. The more I hear it, the more I suspect most of the people working under his name today would probably never have been hired under his watch, regardless of their genitalia. Oh, it wasn’t just the Disney company that went straight to hell; all of society has done likewise, and I’m just glad Walt’s not here to see it. Just look who they’re allowing to serve in the military nowadays – Political Correctness has sure left America defenseless, what with all those “distractions” piling one on top of the other. Walt was right to keep the ladies downstairs in Ink and Paint (Laverne was an exception, but she wasn’t exactly a looker, if ya know what i mean). Luckily there’s a new wind a-blowin’ in America, and guilt-free enjoyment of our noble traditions in entertainment such as blackface minstrelsy will emerge from the shadows, and all those party poopers who don’t like it are gonna have to lighten up. And if they won’t we’ll make ’em, read your Constitution, it says dickish behavior is your Birthright! How about a future feature on some of Alex Lovy’s adventure-style comic book art from the late 30’s, like “Dale Daring,” “Slim and Tex,” or “Hope Hazzard”? Jeff, I still have a few reader requests to catch up on and write about, but Lovy’s comic art from the 30s is not something I know too much about. And to follow up on your comment about Avery, I know as well that LaVerne considered it quite a career high-point to work with him when he returned to the Lantz studio in the 50s. In an interview with Joe Adamsom, she had told him, “I could never get over how perfect Tex was.” And, yes, she was a cornerstone of his efforts on those four cartoons he directed there, including all the animation on the extended clarinet gag in ROCK-A-BYE POINT. The two knew each other going as far back as 1932, and they were a great pairing as creative collaborators. It’s all the more reason to bemoan the loss when Avery and Lantz split after such a short reconciliation, a dispute over money that ended what should have been a much longer run with the inspired teaming of Avery-Harding. They were only just getting started! I’ve seen only a few panels of Lovy’s comic book work, but have been favorably impressed. 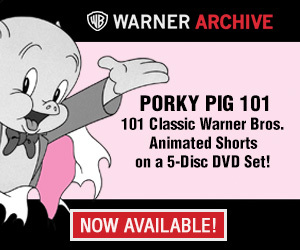 They are at least on a par with comparable work of that time, and totally different from his “funny animal” animation. He had to have been one artist who did NOT have a problem adapting when Hanna-Barbera began making adventure shows in the 60’s, from the designs of Doug Wildey and Alex Toth. PS: Look at Susie’s face (especially the eyes) in the “Endorse it, please” strip, and compare them to some of the typical expressions of Oswald and Pooch the Pup from around that time! I guess I agree with you OH, on the creative blandness of today’s animated features, (with some exceptions, of course). Disney (and his contemporaries) invented the art of animation as they went along, drawing their inspiration from a diverse panoply of visual arts, great music and literature. Much of what we see today is simply animation imitating animation; to create something original, the stimulus has to come from elsewhere.